Before young George fell in love with cameras, he fell in love with cars. Fast cars. Dangerously fast cars. A near-fatal accident in his souped-up motor put Lucas off becoming a race car driver. But it didn’t stop him enjoying the 1995 Monaco Grand Prix as a guest of Red Bull. Much safer, that. 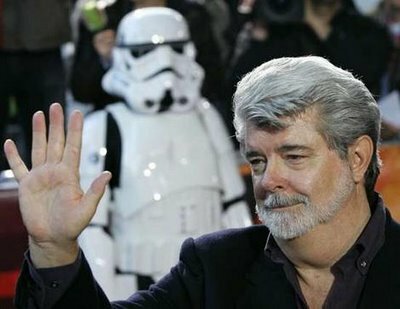 With Star Wars, Lucas practically invented the popcorn-selling Hollywood blockbuster and inspired a generation of movie-fans. Which is weird, because the movies George liked to watch growing up were experimental European arthouse flicks and abstract Canadian documentaries that nobody had ever heard of. 21-87, anyone? Thought not. Apocalypse Now should have been directed by Lucas. His friend and mentor Francis Ford Coppola stepped behind the camera after Lucas got bogged down in working on a weird sci-fi children’s film about light sabers, Jedis and Wookiees. Whatever they were supposed to be. His salary for directing Star Wars? Zero. The 33-year-old waived his pay cheque in exchange for 40% of the film’s box-office and all merchandising rights. Probably the smartest decision in cinema history: Lucas still earns a cut of every toy, book, game and movie that’s released. Which is why he invented Jar Jar Binks. Somewhat unsurprisingly, the man who created Darth Vader has a few daddy issues. His father called him a “scrawny little devil”, shaved his slacker son’s hair off every summer and tried to stop him going to film school. Before leaving, Lucas angrily told him, “I’m never coming back. And I’m going to be a millionaire before I’m 30.” He was one year off. Despite his cuddly appearance, but Lucas once tried joining the US Air Force as an officer. Amusingly, he was turned down because of his numerous speeding tickets. Later drafted by the Army, he was again denied the chance to become a real-life hero again after been diagnosed with diabetes. Unlike his best friends Coppola and Spielberg, Lucas never won an Oscar. He’s been nominated four times (two each for American Graffiti and Star Wars) but only ever bagged an honorary Academy Award. Even his former wife has won an Oscar (for editing Star Wars). Possibly why he divorced her. Pop quiz: what do Beverly Hills Cop III , Hook and Revenge Of The Sith have in common? They all hide cheeky appearances from George Lucas. In fact, his Hook cameo sees him kissing none other than Princess Lea herself, Carrie Fisher. We’re not sure we’re okay with that. But there it is. Given that he helped pioneer computer-generated special effects and stereo surround-sound, you’d think Lucas would be a man obsessed with technology. Think again. When it’s time to write a script, the 64-year-old does it longhand in a loose leaf-binder instead of a computer. The old luddite. Remember how Dr Henry ‘Indiana’ Jones was named after the family dog? That was Lucas’ dog. An Alaskan malamute, to be precise. Star Wars’ furball Yeti-a-like Chewbacca was also modelled the dog’s shaggy looks and gargly voice. Robin Williams owned one, too. A malamute. Not a Chewbacca. Built exactly to Lucas’ specifications for the princely sum of $100 million, the Skywalker Ranch is his very own private kingdom covering 15 acres of the California countryside. It contains a barnyard, a fitness centre, a 300-seat cinema called ‘The Stag’, a hilltop observatory, an underground-parking complex and even its own fire station. Rumours that Lucas is in fact a Bond villain are so far unfounded.